CITGO SUPERGARD Marine Plus 2-Cycle Engine Oil is a licensed NMMA® TC-W3® oil that effectively combats wear, scuffing, deposit build-up, and enhances lubricity to provide longer engine life. Recommended for all water-cooled or liquidcooled 2-cycle engines requiring an NMMA TC-W3, TC-WII® or TC-W® type oil. It may also be used in many air-cooled 2-cycle engine applications requiring API Service Category TC. Recommended for both direct injected and pre-mix systems. 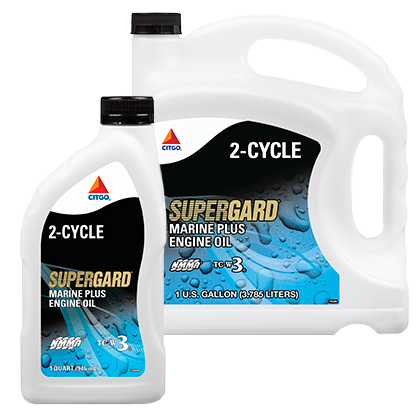 This SUPERGARD Marine Plus 2-Cycle Engine Oil will provide protection for gasoline fueled 2-cycle engines when used at the primary dilution recommended by the original equipment manufacturer.